Today, let's take a look at something different! 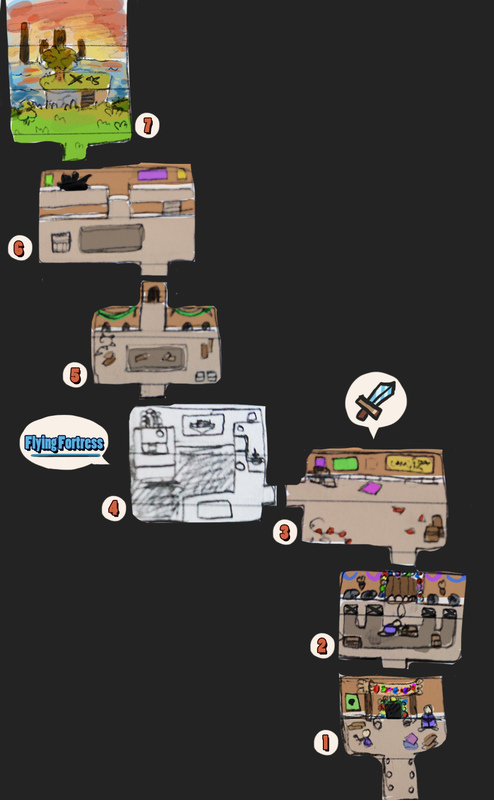 A rough sketch of each of the rooms of the upcoming Puzzle World amusement park, parts of which you'll have to make your way through on your way to find a mysterious treasure. I already mentioned the rooms in a previous post, but now we've actually designed the rooms! The sketches above are very messy and basic, but they show in which order the rooms will appear, as well as and approximation of how they'll look. Room 1 is an introduction room where you'll meet the owner of the amusement park and his workers. Room 2 is the Ancient Statue Puzzle, where you'll have to use statues get to Room 3, where regular battles will take place. Room 4 is sponsored by Flying Fortress and features a Phase Shift puzzle (shown here), Room 5 is where the Monkey Madness takes place, and Room 6 is the "Path Puzzle" shown in the same post as the Phase Shift puzzle.